I went out in search of berries this morning, at the suggestion of Lisa from Greenbow Gardens. In my search around the garden, I found some other 'seed carrying vessels' of interest. These are dry drupes on my Carolina Silverbell, Halesia carolina 'Arnold Pink' . Most drupes have a fleshy skin, like cherries, plums, and peaches. Usually there is just one seed inside, but there may be two or three seeds inside these dry drupes. I bet you didn't think you would be reading a sentence today with those two words combined in it! 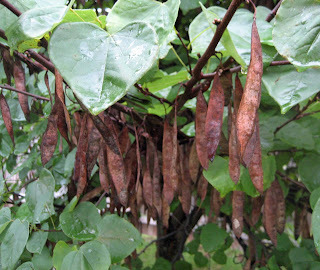 It sounds like what you might call someone to insult them... "you dry drupe, you, why I oughta ..."
Then I found these pods on my red bud tree, Cercis canadensis. This is a sure sign to me that this tree is in the pea family. My neighbor has these crabapples all over her crabapple tree. These are technically called pome fruits. 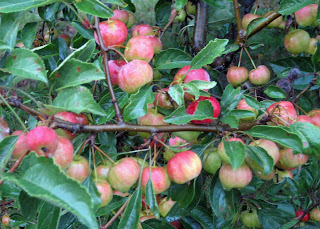 Here are some much smaller pome fruits on my crabapple tree, Malus 'Guinevere'. The birds will eat these in no time. 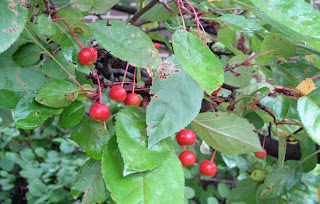 I also looked for some pome fruits on my Serviceberry, but the birds had already eaten all of them. I wonder why they don't they call it a Servicepome? These "seed carrying vessels" are on the Lily of the Valley, Convallaria majalis. I squeezed one and it had one seed inside and was all gushy. I think it must be a drupe. It's also quite poisonous. Yes, it's a poisoinous drupe in my garden. Finally, I arrived back to nearly where I started and found my beautyberry shrubs, Callicarpa dichotoma 'Issai' . I assume these are true berries, but you never know! Thanks for adding "dry drupes" to my gardening lexicon. 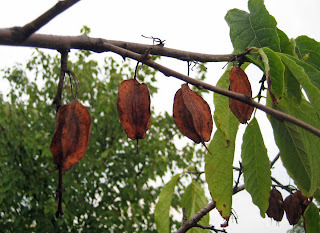 Dry drupes-dry drupes- dry drupes it's fun to say those words -can't wait to call somebody a dry drupe. It's always a treat to come to your blog I never fail to learn something new. I love seed pods. The beautyberry looks great. Wow, now that's fall color. I am very envious of your crab apples. I have had mine seven years, and they have not fruited yet. I must get some beautyberry, they truly live up to their name! So now I'm pondering whether I have berries, drupes or pods on various plants. Beautyberry is easy enough but what about the Mexican buckeye? I think pods: no gushy stuff. Maybe I don't have ANY drupes. Should I remedy that? Carol, I have learned a new word, Drupe. I wonder why I have never read this word before?? It has a good sound, Drupe. Sounds like a good name for a Basset Hound. 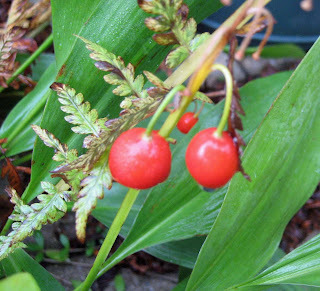 You are the second person to post those red berries of the Lily of the Valley. I have LoV but I have never seen a berry on it. I wonder why? Thank you for the link. I think this seed, drupe, pome thing is fun. West Coast Island Gardener, thanks for the nice comment, 'dry drupe' is fun to say, isn't it? Blackswamp_Girl, the beautyberry has been in my garden for a year and so far, it hasn't been fussy at all. When it got dry in August, it needed no supplemental watering. Vanillalotus, I love seeing all the different kinds of seed pods, too. Anthony, thanks for such a nice comment! EAL, I agree, that beautyberry provides great fall color. It beats out mums any day! Morning Glory in Round Rock, There's a C. americana that would do well in your Texas garden, I think. 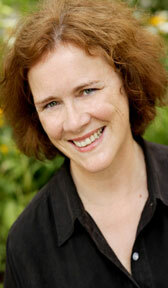 Frances, What would be the 'knock out punch'? After 'dry drupe' what is there left? Lisa at Greenbow, it was a great idea to post about our "berries". I've noticed "whatever that is" on my LoV several years in a row... They grow in mostly shade up by the house, and it can get dry there. 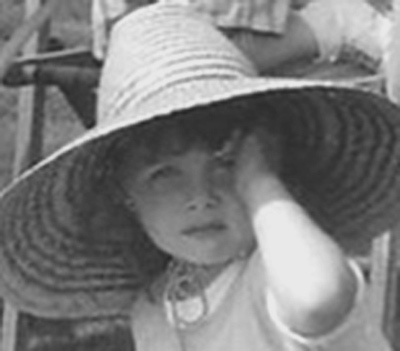 Thanks all for joining in with comments. None of you are 'dry drupes', that's for sure! I do like the word drupes and it is a perfect sounding insult! Pomes is another great word! But seed carrying vessel is surely ... my favorite! May I quote you on it? Congrats on your Blotanical nominations! Fantastic. The drupe I'd want most is a raspberry. I'm happy to see your drupes aren't too droopy. Nothing worse than droopy drupes. You have a good assortment of pretty pods, fruits & pomes. The poor birds rarely get a taste of my crabapples because the piggy squirrels devour them as fast as they can stuff them into their faces.